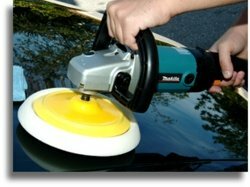 A quality auto polisher will be the answer to most people looking to take their car paint to the next level. Not only does your head fill with visions of shiny and glistening paint, but the thought of using a professional car polisher sound instantly appealing to most car enthusiasts. Unfortunately it is an area of car care filled with more bad information than good information, and if you don't proceed with caution, you could find yourself making decisions based on both limited information as well as bad information. Unfortunately most of the auto polisher reviews will be little more than regurgitated product labels all designed to separate you and your money in the form of a car buffer of some kind. Rather than educate you first so you can make an informed decision, most auto polishing reviews will be a little use to you when trying to determine the best car buffer or polisher that would be the winning combination of features for you. My professional detailing tips are designed to help you make a more educated decision by giving you unbiased opinions and information. Often people like yourself make important decisions based on limited information. In today's world of the Internet, we are constantly bombarded with misrepresentation in the form of strategic marketing and advertising. If you are anything like me, you don't enjoy reading review after review finding yourself more and more frustrated after each opinion and review you read. The car and detail forums are filled with wannabe "experts" spreading bad information based on limited experience and personal agendas. It's enough to make my head spin and my eyes roll back into my head in a frenzied froth of frustration. (Hyperbole anyone?) The countless forums are filled with endless opinions and I am willing to bet you have spent hours doing your due-diligence only to walk away each time more frustrated and confused than before! "Darren, I don't want to read the endless reviews on a top rated auto polisher. Can you simplify the decision process for me?" If you enjoy the process of research and want to learn as much along the way about auto polishers, then by all means use any of the following links to help yourself become an informed consumer and car enthusiast. No longer is professional grade car buffers reserved for the experts. Let Darren explain the difference between rotary and orbital. Darren breaks the myth around the infamous high-speed polisher and takes you step by step in choosing the perfect automotive polisher for you. Random Orbital Polisher Q. and A. Follow this simple and straight forward question and answer session and see if you don't go away feeling like an expert on the subject. Rupes has become the new "king of the hill". 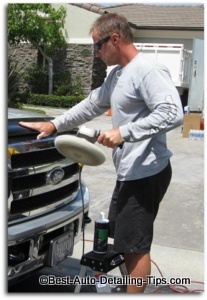 See if this Rupes car polisher review helps you decide if it represents the winning combination for you and your world. Flex polishers are German made quality. For those who demand nothing but the top of the line then Flex maybe just the answer for you when it comes to picking out the best auto buffer. Cyclo orbital buffers have been around for years. Read the review to see if this is the right choice for you. The DeWalt car buffer is professional grade equipment. Time to see if this quality tool of the trade is the perfect choice when shopping for a top rated car buffer. See how this very popular orbital car buffer rates aginst the competition while going through the comprehensive checklist to see if this is the perfect car buffer for you. 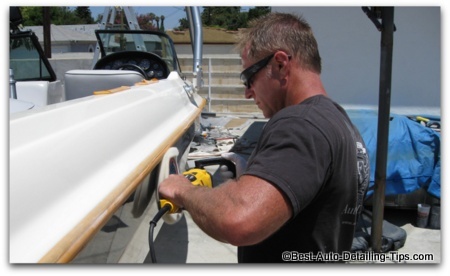 Most boat owners don't understand the nature of fiberglass or gel coat when it comes to polishing. Let Darren lay out the questions you didn't even know to ask as he walks you through the decision process to finding the best boat polisher for you. Come back often as we will be continually adding to this section. In no time you will become part of a select group of people known as the educated! Thank you for visiting Auto Polish Reviews. I bet you know of at least one person who would benefit from the information I have taken a whole lot of time to write and build within this page. You can use the social media links contained on the left hand side of this page to easily share with any of the social media platforms you like and use.